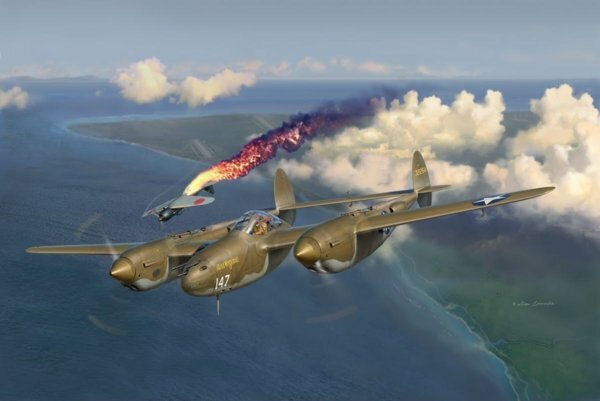 P-38 ace Rex Barber flew the P-38 Lightning in the 339th Fighter Squadron, 347th Fighter Group. On April 7, 1943, Barber engaged several Mistubishi Zeros who had appeared near his airfield, Fighter Two, on Guadalacanal. Near Cape Esperance, Barber downed two of the Zeros, his second and third victories. He went on the score two more confirmed and three probables by the end of his tour. One of the last two was on April 18, 1943, when Barber and his squadron flew a long over the water interception of Admiral Yamamotos flight over Bougainville Island, shooting down the Admirals bomber and killing him.